Royal Beets handcrafted candies are made with real beet root slices and are slowly dried to maintain the powerful nutrients naturally found in beets. or Fresh Zesty Lemon! Cheat healthy snacks, for you and your kids to enjoy! ​Delicious earthy goodness with a little lemon zest. 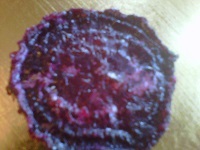 Our delicious beet candy slices delicious snack for your entire family. Introduce a delicious and nutritious to your entire family. Also makes a beautiful garnish on desserts and savory dishes.